We just played a game of Magnate tonight and both enjoyed it. I've never played Settlers, so I can't really compare them, but I liked how the game uses the decktet components well, taking advantage of its special characteristics. The way resources are produced, the higher cards have much better chances of producing than the lower ones, but the lower ones are much easier to place on the board, so our game saw many turns where nothing was produced. I can see how placing deeds for high cards can be useful because you at least get one resource for the card. Also, it's better to have your resources as cards on the board where they're not affected by taxation (Twice in the game I had to pay 4+ resources to the taxman just when I was about to use them to play a higher card!). In this game I was the only one to place a deed, but I think it was worth it in the end, as it won me the district at the end of the game. Also, it seems that it's easy to score the same number of VPs, as there are just four districts. Our game was decided by the total ranks of the cards as my gf managed to steal a district from me on the last turn. But in the end I totaled 40 vs. her 37. It was pretty close though. I have the rules printed out on this one and I'm looking forward to trying it out, probably this weekend. If it's not solitaire, I have a hard time finding an audience over here for it. Regardless, I want to get a test solo play in before I teach it. Somewhat off-topic, but is there a vassal module that features the Decktet? I haven't researched it, but it might be handy for playtesting this kind of thing out. Does it make sense for the districts to instead start with the Aces instead of the Pawns? That would give you 6 districts. The other thing that might be worth doing is not counting the poorest district…. this would give you an odd number and remove some of the tie-breakers. A downside (among others) would be that if you are playing with same-color tokens, you don't have an easy way to track them. Again, have to tinker, but interesting game concept…. Regarding a Vassal module: Nathan Morse (zefquaavius on BGG) was talked about making one a while back. I don't know if he made any progress on it. [jakk] Does it make sense for the districts to instead start with the Aces instead of the Pawns? We tried this at one point during development. This would make the game shorter, by taking more cards out of the deck. And there would still be an even (although larger) number of districts. 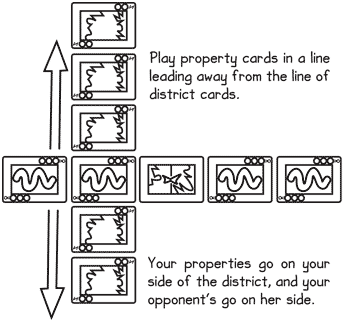 The idea with Pawns is that, with three suits, they give you lots of options as to what you can play there— but with only four districts you can end up unable to develop a property you have a card for in the end game, depending on what you've built so far. Although calling district control "victory points" may suggest otherwise, the game often ends up as a tie on districts. The first tie-breaker (total rank of developed property) decides many if not most of our games. This is really the only reservation I have about the current design. Your idea of having one of the districts not count is interesting. Another possibility is to use the Excuse as a fifth district. [maka] …maybe if the highest dice doesn't produce anything, let the other die produce, or maybe just rolling one die (did you try this? if so, how did it go?). Another possibility is to use the Excuse as a fifth district. This idea is worth trying. Elegant, simple and doesn't mess with the core rules. Yeah, my thought was that your first property in the Excuse district could be anything. After that, it would follow the usual rule: A subsequent property must share a suit with the immediately previous property. Of course, I haven't tried the game with five districts. Cristyn is sceptical of the idea and suspects that the fifth district would open the game up too much. So let us know how it turns out. Tonight we played a couple of games of Magnate with 5 districts. Our first impression is mostly positive as both games were won without the need to use a tie breaker. This time we both bought deeds more often (even for cards as low as 6-7) and the game felt very tight although in the end the game wasn't so close, we felt it was so while actually playing. I'm not sure the fact that there were more districts really affected the game that much. It did feel a bit more open in that we had more options to start building, but as a player has to get 3 points for a sure win, players will still have to fight over at least one district (and in both our games it felt like more). The decision of what districts to fight for and which ones to let go is (I think) harder with this change. We have now tried two games with the Excuse as a fifth district. It changes the strategy, maybe making it richer. I need to try it more before I decide. I think that five districts might genuinely make games tighter. Even if you have one or two unassailable districts, your opponent might always try to get ahead in the others. I tried this with my 6-year-old tonight. It was a fun game, although we were both stumped in the beginning and didn't build our resources properly at all. We both pretty much ran out of cubes and had a lot of tax draws. We played with the Excuse. In the one game we did, we tied on one district (competing Aces) so it didn't matter as we split the other two. I had 7 cards to her 6 cards, however, she's a kid so she gets extra points and I lost. After having played with the new rule several times, 5 districts is now the official rule for Magnate. I've changed the official page. One suggestion to remove a bit of arbitrariness from the middle district. How about a rule that only aces can be placed next to the Excuse? Makes it a little bit harder but not overwhelmingly so. It is possible that a player just wouldn't draw any aces, and then they couldn't contend for the middle district at all. Having played it a lot, I don't feel that there needs to be more restrictions on placement. What you call arbitrariness with the Excuse I think of as freedom! Obviously, you have played a lot more, and I should play this more myself before suggesting house rules. But I would consider myself lucky not drawing an ace during a whole game of Magnate even with the house rule in place. Thought experiment: We draw from different piles, one has the aces removed. Would you rather play the other deck, monopolizing the Excuse in return for drawing fewer income generating cards? If there were was a separate pile for Aces and I needed an Ace to start on the Excuse, of course I'd draw an Ace. Giving up the Excuse would be terrible, since there are only five center cards in contention. In play, the restriction on placing next to a Pawn doesn't really make too much difference. After you have placed your first card there, the Pawn doesn't matter any more. So it is just something to break the symmetry at the very beginning. Since the Excuse can take any first card, it makes sense to save it for last. 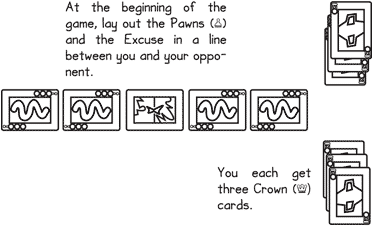 Similarly, though, once you've played a card at the Excuse then you are constrained by the last card you played there. If there were was a separate pile for Ace and I needed an Ace to start on the Excuse, of course I'd draw an Ace. I didn't suggest there was a separate deck with only aces to draw, only one complete deck and one with aces removed (and you choose your deck only once per game). Even given my lack of experience with the game I'd gladly take the deck with aces removed over a deck with aces only. My point is that I might even choose it over a complete deck, forfeiting one of the districts in return for generating a higher expected income. You gave a good explanation why I felt like adding this house rule. "It makes sense to save the Excuse for last". That's one decision which is obvious, and I felt like adding a decision which is non-obvious (build on Excuse with ace or wait for an ace which fits your hand better). 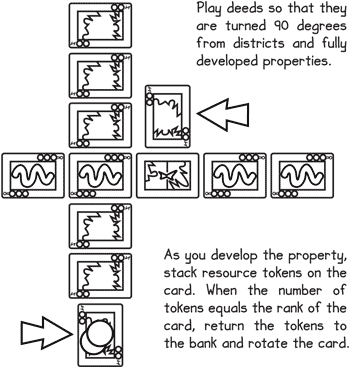 A player may develop a Court as a property by spending 10 resource tokens matching any of the three suits, with at least one matching each of the three suits. Not being a native speaker but doesn't that mean that one token would have to have three colours? EDIT: wrong reference to message, should have beesn starting a new thread on the rule wordings. Hmm… As I read the English phrase "at least one matching each of the three suits", it's ambiguous between requiring three tokens (one for each suit) or one tri-coloured token. That's the grammar of it. Since tokens only represent one suit each, context fixes it to mean three tokens. Maybe I'll take a crack at rewording it. Any video on how to play? Sorry, I am new card gaming and board game scene. I just found out this game, but it's hard to understand the rule. Is there any video out there showing how to play Magnate? Really appreciate any help. Re: Any video on how to play? There are two listed at BoardGameGeek; unfortunately the wiki won’t let me link them. It is easier to pick up new games when you have experience with other games, as game mechanics tend to show patterns between different games. This game has similarities to Settlers of Catan, but also Machi Koro, in that dice decide which cards create wealth in this round. The goal of the game is something which can be described as "majority rule", as not the total value of your cards is counted but the majority at each plot. Think best-of-five match. A game classic using this condition is El Grande. These are the core elements of the game. You may be able to work out the rules with these elements in mind. It is hard to start on rules if you have no idea what the game is about. Taxation is used to deter players from hoarding goods (otherwise playing deeds were inefficient).